Popocatepetl began the day with a series of exhalations and tremors that lasted almost three hours, continuing the heightened activity seen over the previous 24 hours. During that time the volcano, also known as El Popo, emitted 209 low-intensity exhalations of vapour, water and ash. "The series of volcanic exhalations and tremors that started today at 5:23am concluded at 8:19am, with a total duration of 176 minutes," said a report issued this morning by Cenapred, the National Disaster Prevention Center. "The height of the volcanic cloud reached an average of one kilometre above the crater, and the winds spread it to the east-southeast." The volcano alert for Popocatepetl, located in central Mexico, remains at yellow, phase two, but Cenapred has added the precaution of warning the public living nearby to stay away from it, as the constant emission of material presents a real danger. 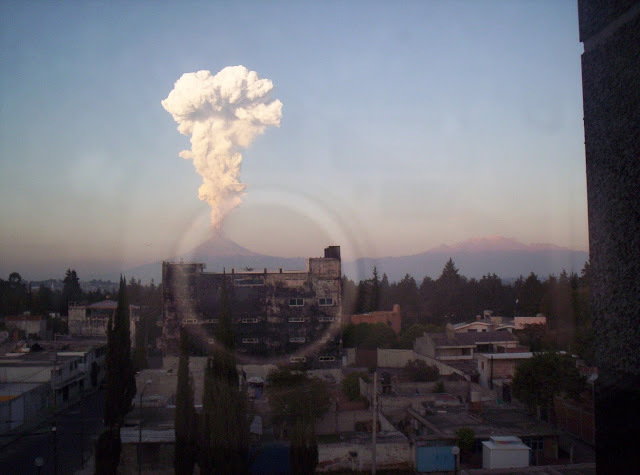 Cenapred specialists forecast that low to intermediate explosive activity at the volcano will continue, and that light to moderate ashfall is to be expected in the closest towns and villages. Short-range pyroclastic and mudflows are also to be expected.